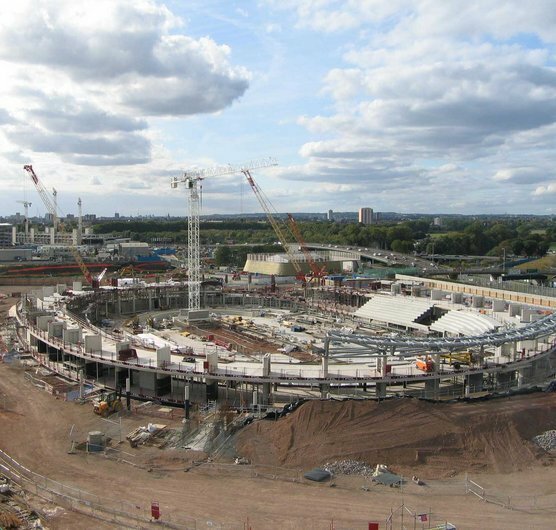 New images released by the Olympic Delivery Authority (ODA) today show the construction of the London 2012 Velodrome racing ahead with work well underway on the structural steelwork that will help form the distinct double-curved shape of the venue. The 6,000 seat Velodrome will host the Olympic and Paralympic track cycling events in 2012. The Velodrome design features a lower tier of 3,500 seats and an upper tier of 2,500 seats with the seating tiers divided by a 360 degree concourse level offering views over the Olympic Park and out to the London skyline. Construction work on the Velodrome began on schedule in March and the 360 degree concourse level is now nearing completion. Work is also now well underway to lift the first sections of structural steelwork into place to form the Velodrome roof structure and support the upper tiers of seating. More than 2,500 sections of steelwork will be installed altogether to complete the roof structure and upper tier of the Velodrome. The steelwork sections rise in height by 12 metres from the shallowest point to the highest part of the structure, helping form the distinct double-curved roof structure which has been designed to reflect the geometry of the cycling track. At the track level of the venue, several sections of steelwork have already been installed in the lower tier of seating with the first pre-cast concrete terracing units now in place. Work on the steelwork that will support the cycling track is also now underway and due to be completed early next month. Bolton-based company Watsons Steel is supplying the fabricated steel for Velodrome structure to the construction contractor in a deal worth over £3million. "The Velodrome will be another landmark new venue in the Olympic Park and with work underway on the structural steelwork we can begin to see the striking architecture of the Velodrome take shape. The good progress we are making on site keeps us on track to deliver a world-class stage for elite athletes in 2012 and the legacy of first-class facilities for a new generation of cyclists." "Steel fabricated in the North West is playing an essential role in shaping the Velodrome and demonstrates the role that companies across the UK are playing in helping deliver the venues and infrastructure for the London 2012 Games." After the 2012 Games, the legacy Velodrome will be used by elite athletes and the local community and will include a café, bike hire and cycle workshop facilities. A road cycle circuit and mountain bike course will be added to the Velodrome and BMX circuit to create a legacy VeloPark that will combine cycling facilities across all disciplines in one cycling 'hub'." The legacy VeloPark will be owned, funded and operated by Lee Valley Regional Park Authority. The construction of the VeloPark facilities includes funding from Lee Valley Regional Park Authority (LVRPA), Sport England, Transport for London (TfL), and the London Marathon Charitable Trust (LMCT).